Little of the NCN is on dedicated bike paths. Though many routes try to minimise contact with motor traffic, 70% of them are on roads. The NCN uses shared use paths, disused railways, minor roads, canal towpaths and traffic-calmed routes in towns and cities. As of August 2014[update], there were 14,700 miles (23,700 km) of signed cycle route to NCN standards. There are ten national NCN routes; these are numbered from 1 to 10. As of 2018[update] they are not all complete. Route 4: London (Greenwich) – Fishguard, in West Wales, via Reading, Bath, Bristol, Newport, Caerphilly, Pontypridd, Swansea and Llanelli. There are four different types: "Fossil Tree" (designed by John Mills), "The Cockerel" (designed by Iain McColl), "Rowe Type" (designed by Andrew Rowe), and "Tracks" (designed by David Dudgeon). The four artists are from each country of the UK, though all posts can be found in all four countries. ^ "National Cycle Network". Essex Council. 2012. Archived from the original on 27 August 2012. Retrieved 24 September 2012. ^ a b Hesdin, Farah (29 November 2011). "The UK on a bicycle: the National Cycle Network". Bikenet.com. Archived from the original on 4 November 2012. Retrieved 24 September 2012. ^ "About the National Cycle Network". Sustrans. Retrieved 7 August 2014. ^ "Route numbering system". Sustrans website. Sustrans. Retrieved 12 December 2013. ^ "National Cycle Network Mileposts". Geograph Britain and Ireland website. Retrieved 12 December 2013. 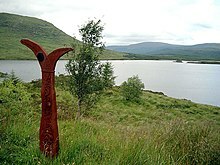 ^ "National Cycle Network - Art - Mileposts". Sustrans website. Sustrans. Retrieved 12 December 2013. ^ "Secrets of the Millennium Time Trail". Secrets of the Millennium Time Trail website. Retrieved 23 August 2015.